A popular service Wiideman Consulting Group has offered to many prominent brands is our SEO Strategic Plan, a comprehensive audit and strategy for contextual, technical and visibility focal points that may improve search engine visibility. With the right team and following ethical SEO best practices, our recommendations have had a 100 percent client success rate that we are proud of. What’s in Our SEO Strategy? 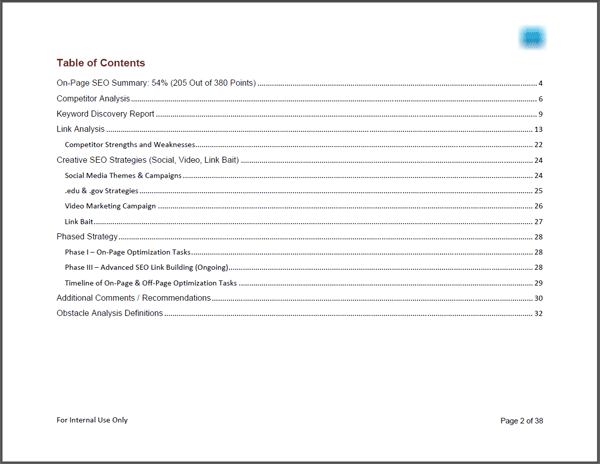 Below is a screenshot of a table of contents from one of the SEO Strategic Plans we’ve written. Topics and focal points will be based on your individual need and may have more emphasis on current technologies and platforms, such as mobile. We understand that each client’s needs are different, and there is no “one size fits all” solution for SEO. When completing your Client Needs Analysis, please be sure to provide as much detail as possible. Our team will host a “Kickoff Call” with you prior to starting our research, so you’ll have plenty of time to go over everything with us. Call our office at (562) 732-4417 to ask about current audits and pricing.